The Scientology Information Center hosted a special Open House Reception for Downtown Clearwater visitors on January 25th. The Scientology Information Center is open for tours daily from 10 am to 10 pm. CLEARWATER, FLORIDA, US, January 31, 2019 /EINPresswire.com/ — Ms. Amber Skjelset, Manager of the Scientology Information Center hosted a special reception and Open House during Downtown Clearwater’s Blast Friday concert. The Center offered refreshments, southern hospitality and answers to questions about the Church of Scientology and its religious beliefs at its location, 500 Cleveland Street, the Historic Clearwater Building. Close to 100 lbs of cookies, cheese and fruit and refreshments were served throughout the evening to the continual stream of visitors as well as hot coffee to help keep the chill at bay. In addition to watching videos on aspects of Scientology and its founder – L. Ron Hubbard, guests were able to choose from an array of complimentary materials covering information about the Church of Scientology’s religious beliefs, the humanitarian programs it sponsors (mentioned above), and Churches of Scientology around the world. Visitors also learned about the upcoming Downtown Block Party, (on Feb 9th) Celebrating Valentine’s Day, sponsored by the Church of Scientology Flag Service Organization. The event highlights over a dozen local non-profits and shares solutions to societal ills through the Church of Scientology-sponsored humanitarian programs such as Foundation for a Drug-free World, United for Human Rights and more. It is a family-friendly event with complimentary kids’ activities, games, prizes and more. The Scientology Information Center, located in the Historic Clearwater Building in downtown Clearwater, opened on July 11, 2015, and currently houses a gallery of audiovisual displays with some 400 videos. 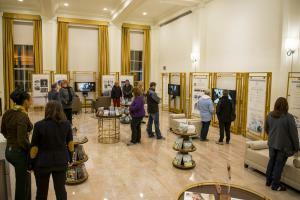 The Center is open to all and provides a self-guided tour showing basic Scientology beliefs, Churches around the world, ongoing social programs and the life of L. Ron Hubbard, Scientology's founder. The Center offers tours to the broad public and civic leaders; holds concerts, theatrical performances and receptions for the community; and opens up the use of its conference room to social, civic and non-profit groups. For more information on Scientology, visit www.scientology.org or the Scientology Network on DirecTV channel 320, or streaming at www.scientology.tv or apps at appleTV, fireTV and ROKU.